The insightful and concise Islam & Christianity resource compares the basic beliefs of Christians and Muslims (followers of Islamic faith) in a single glance. It helps believers understand the key differences between Muslims and Christian. It looks at key issues and asks, "What Muslims Believe," "What Christians Believe," and addresses "How to Correct Misunderstandings." With this knowledge believers can reach out to Muslim without offending cultural sensitivities. More than one billion people around the world follow the teachings of Muhammad and Islam. Islam & Christianity is an excellent tool for pastors, teachers and others who are interested in discovering the beliefs that Christians and Muslims have in common and those that are different. This tool will help pastors and leaders equip missions-minded believers to avoid common witnessing mistakes and to be more sensitive about sharing their faith with Muslims. 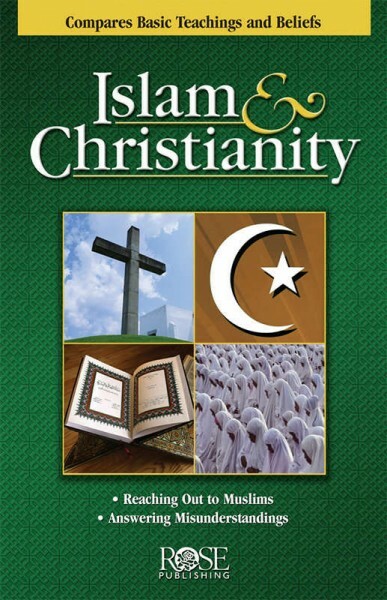 Discover what Muslims have been taught about Christianity and how to answer their questions and concerns. Many Muslims misunderstand the concept of the Trinity. Some Muslims are worried that Western society will corrupt their children because of the images they see on TV and magazines. Muslims are committed to the Five Pillars of religion. In Islam, there is no savior; Allah is supreme. When sitting don't point the sole of your shoe toward anyone.